Why isn’t public transport operator compensation automatic? Metro missed its performance target in December, issuing an intriguingly vague statement which initially did not mention the compensation payable nor link to the form required. It’s since been modified to include those. Generally speaking if you have a Pass of 28 days or longer, and travel on trains more than 10 times in that month, you get the equivalent of a daily Myki Money fare back… for some Yearly users, this is actually close to the cost of two daily fares. You’ve only got until the end of the month to claim, so get to it. Some figures I remember seeing some time ago suggested less than a third of eligible passengers claim the compensation. Update 28/1/2013: I finally found the info I knew I’d seen… it’s from 2010 and actually it was about 5% of eligible people who claim compensation. It raises the question of why the compensation can’t be automatic. It’s something I recall raising with officialdom at one point. One reason cited was privacy considerations. But there’s ways around that. 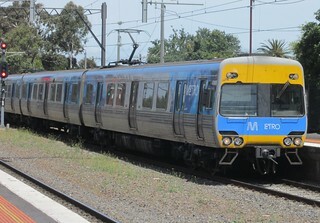 The Myki database is used to rule whether a claim is eligible. This means it could also be used to actively work out who should get the compensation. If the government had pursued this, it could have been a genuine benefit of Myki over Metcard. Metro: Hey PTV*, we owe people compo! Can you let us know how much money is payable? PTV: yeah no worries Metro. We’ll just scan the database. Okay, apart from the people who opted out of getting auto compo for privacy reasons, it’s X people, with a total of $Y due. Of course, with less than a third 5% of people bothering to send the forms in, one doesn’t need to be a brainiac to realise why this doesn’t happen. A semi-automated form is doing the rounds: enter the details and it’ll produce the filled form for you to post. *On January 1st, Public Transport Victoria subsumed the Transport Ticketing Authority. …I assume the post has lasted this long without comment because it’s so self-evident that is should work like this. Why not go further? Myki knows where and when you touch on, and (normally) where you touch off. Why not process the data and directly compensate those customers that were directly affected by a major disruption? Who knows, this might even be cheaper than trying to compensate everyone. The beauty of this approach is that the processing could be done in a completely independent system to the actual Myki system. Just dump the data, crunch it, reload the compensation list. Almost no software risk and development could be done independently of Kamco. I wonder if they would accept a form filled in using a typewriter? Going further, why shouldn’t every holder of a registered Myki card receive compensation? I can understand why the threshold was set as a monthly under Metcard, but with Myki there’s no reason to effectively discriminate in favour of commuters and against people who use the system regularly but not in a pattern that requires a 28-day pass.